Tim, you already know your opponent in Vendetta, what do you know about him, how can you characterize him? – Actually, I don’t know very much about him. Have you already started preparing for the fight? With what weight are you going to come to the fight? – Right now my weight is at around 305 lbs. And I have started my workout routine, focusing mostly on strength. Will you study the fights of your opponent while preparing and analyze his style? – I have looked at a few videos, but not much. But I have good idea on how he pulls. I take every fight as it will be hardest fight I will have. Can you share your plan for a duel? – I plan on winning!! Do you plan to participate in the Zloty Tour tournament? – I do not plan on fighting in Zloty Tur. I would love to compete there but I don’t want to take chance on injury. I made commitment to PAL to give them six rounds of hard fight. That’s what I will do! Tim Bresnan is laconic as usual and he prefers to show his intensions at the table. We wish him good preparation and easy adaptation process before Vendetta All Stars. 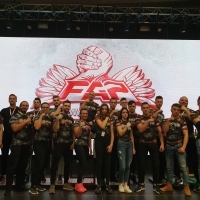 Scot Mendelson: "There’s still lots sweat and blood to put in my new passion "
Sonia Miras: "I will never get tired of armwrestling"
Dmitry Silaev: "It will be definitely difficult at the Zloty Tur"